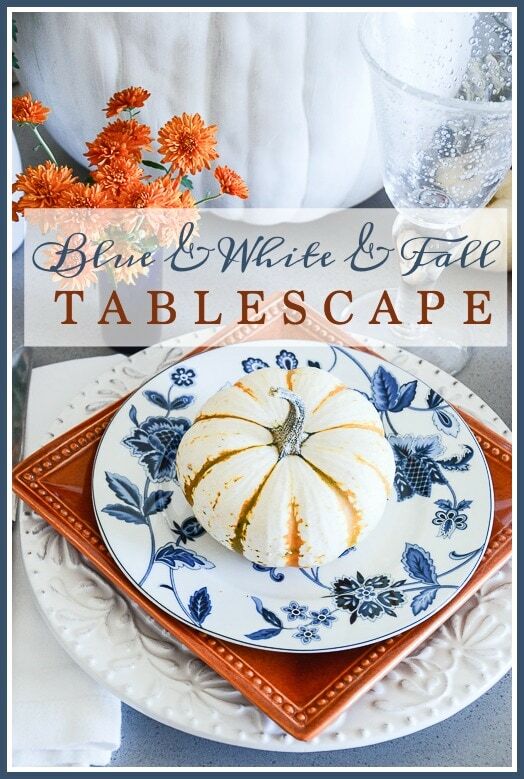 I had so many appointments today and I had a Fall table setting promised for my fabulous blogging group today. I was going to run to the store to get flowers for my table, then it occurred to me that you probably have company coming over with no time to put a table together. So instead, I opted to put a table together using what I had on hand. I know this happens to you, so I wondered if I could come up with a few unorthodox ideas. First I selected my dishes. I always first decide which dishes I will use and find things that will go with those dishes. This set of vintage Booths dishes made in England is new to me, and I really wanted to use them. It’s basically a service for 4. If I had company I would just supplement with some other dishes. Next I selected the tablecloth. I pulled something things from my closet and looked at some options. I grabbed some fabric remnants, a quilt, and a plaid throw. I decided against the throw, but I’m going to show you the table two ways with a quilt and a fabric remnant. Here’s the quilt. It’s super fun and I love the texture. 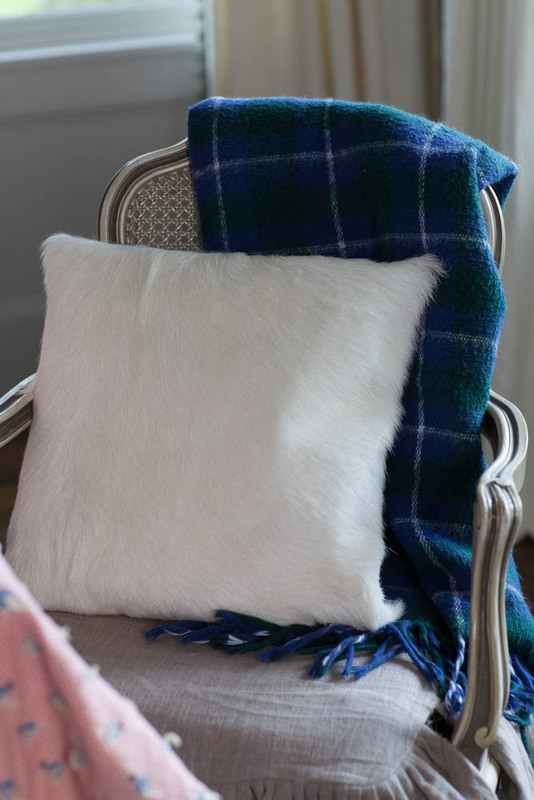 I put the throw on a chair and added soft furry pillows. Be sure to leave a comment. 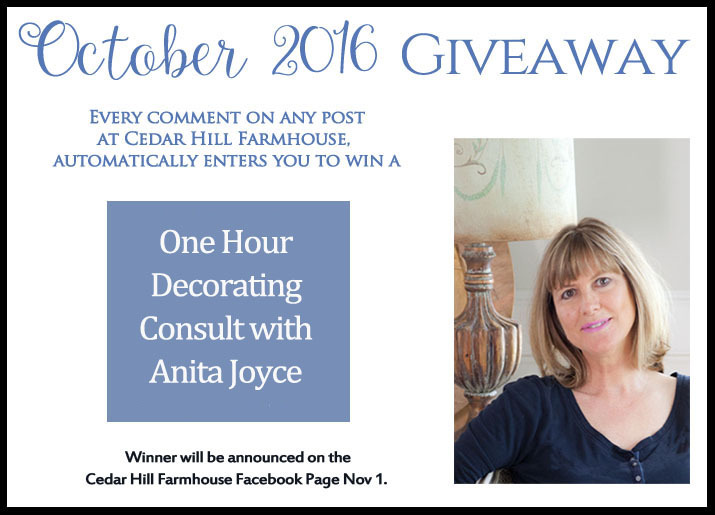 Every comment on any post at Cedar Hill Farmhouse blog enters you to win a one hour decorating consult! Details here. 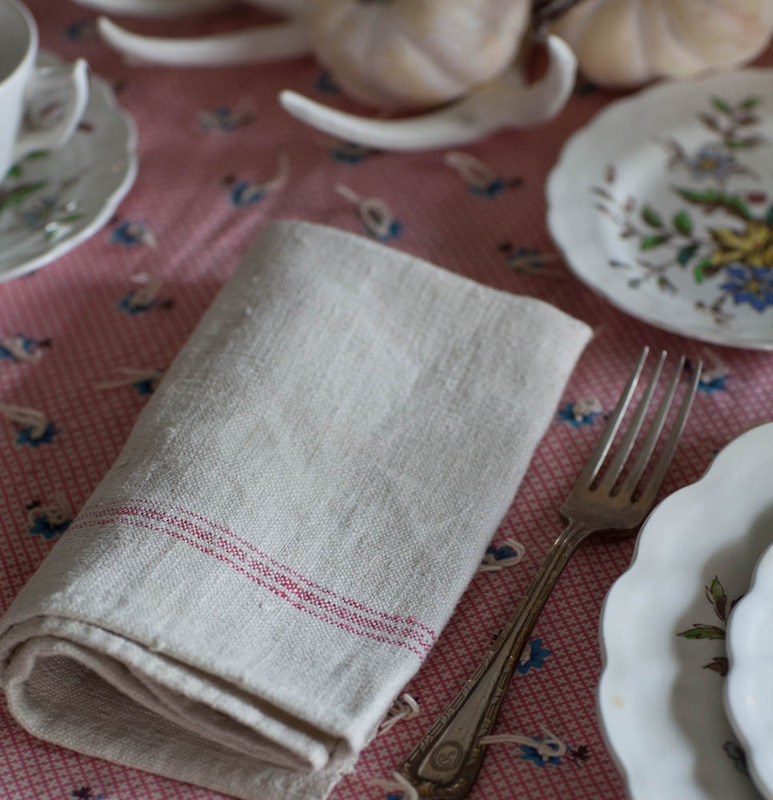 For napkins, I used some antique linen torchons (towels) from Europe. The silverware is vintage hotel silverware from The Pierre. I love these blue striped pitchers, and have about 4 of them. I did a bit of research and it looks like they were made by Marshall Pottery in Texas. Since I was doing the table in 10 minutes I did not get flowers from the grocery for my centerpiece, but used what I had on hand, my little white pumpkins, a stalk of wheat and some antlers. This is what I’ve been saying. Buy a few quality items you love, and you can use them over and over again. Yes I know you’ve seen them before. 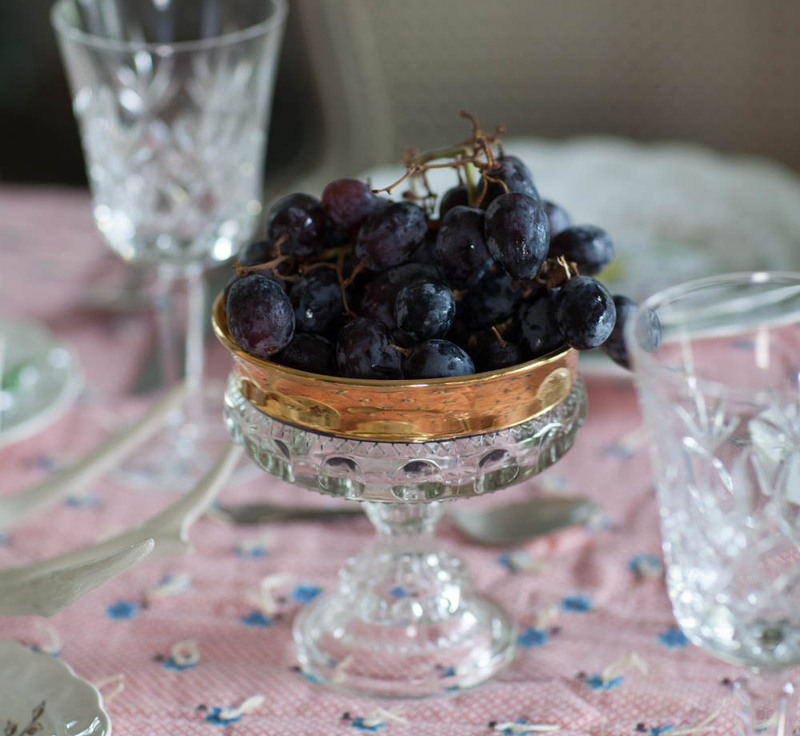 I also added some grapes in these footed bowls we inherited. I also redid the table with some leftover fabric so you could see it both ways. This look is more elegant but less fun. I love both looks. I just depends on what mood you are in and the tone you want to set. 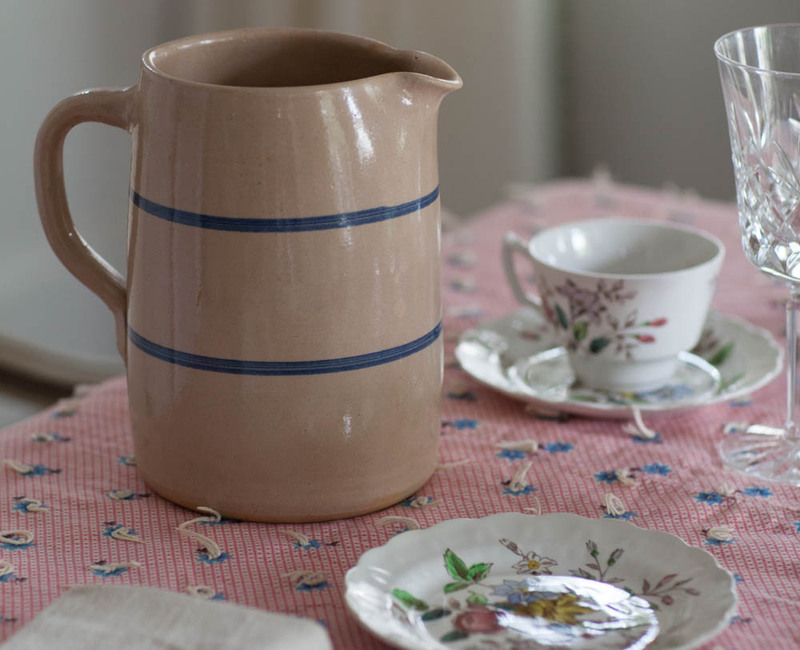 What would you put on your table if you just had 10 minutes? Check out the other blogs on our It’s all Set tour today. Tina you are the queen of the the tablescapes! Me too Teresa. When are you coming over? Would love to see you. 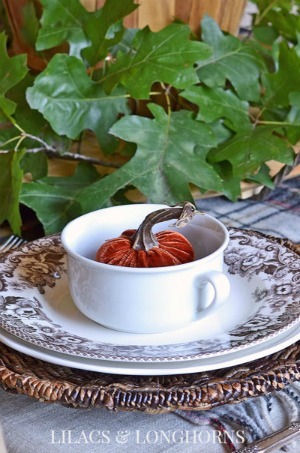 if I had 10 minutes I would put the wheat in one of the pitchers and it and the pumpkins etc on a tray of some sort or even a low sided basket, add some fall leaves either faux or from the yard. 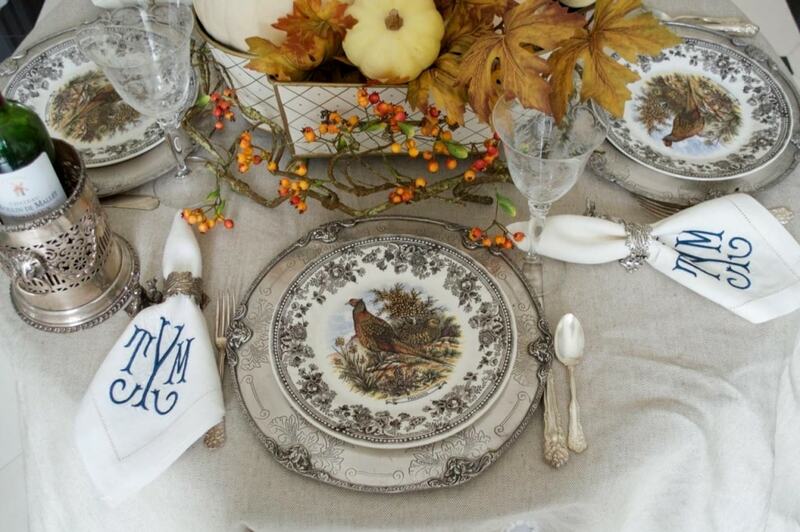 like the fabric remnant and the dishes and silver are pretty and maybe a few candles for brightness. Fantastic idea Jill. I need you to come over and style for me. I agree, the footed bowls are to die for! 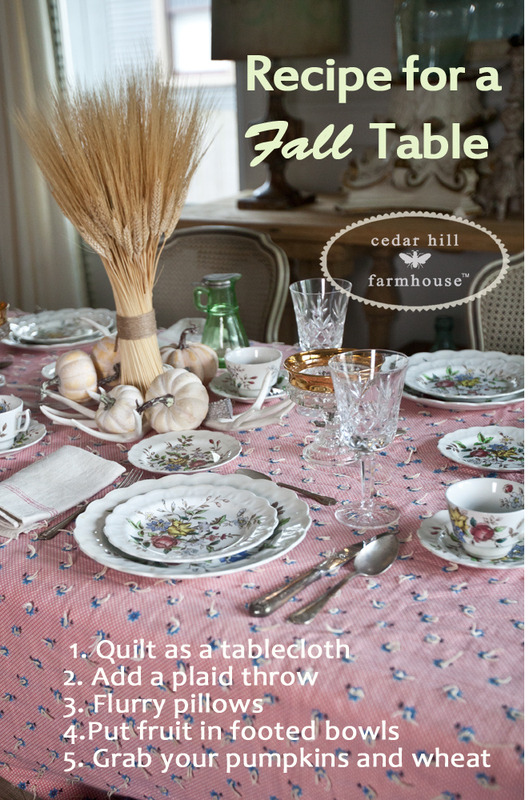 The quilt is a fun look but I LOVE the fabric remnant table. I sometimes decorate on the fly and my latest table was decorated with greenery from the yard (I think they may have been weeds, lol). I also decorate with weeds Elizabeth, why not? I love your table. I think Marshall Pottery has closed now. I use greenery that I pick and collected things. Love your table. I LOVE the quilt idea. I am going to check out what I have on hand. Your table is lovely. You have given me lots of ideas. Awesome Heidi. 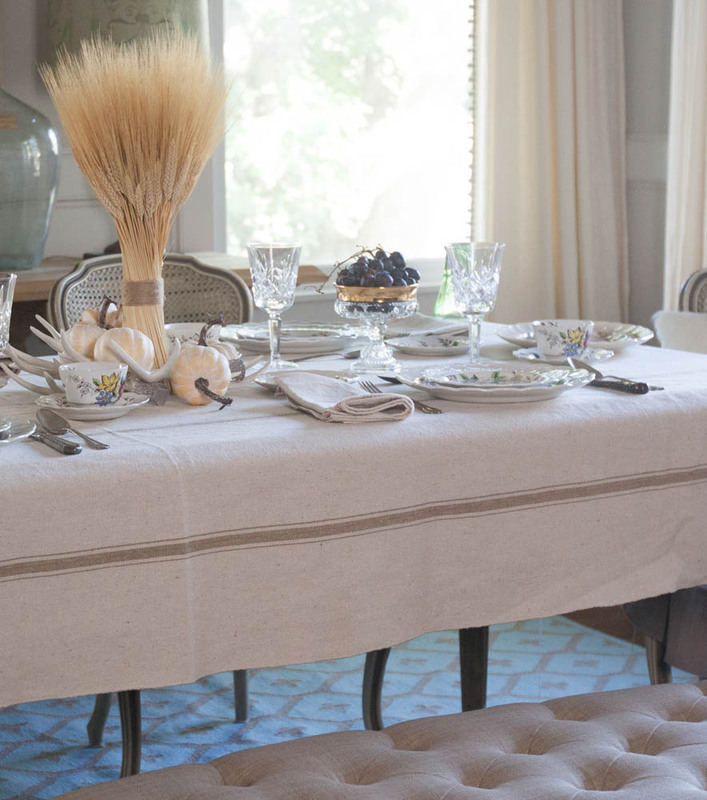 I love using non-tablecloths for the table. 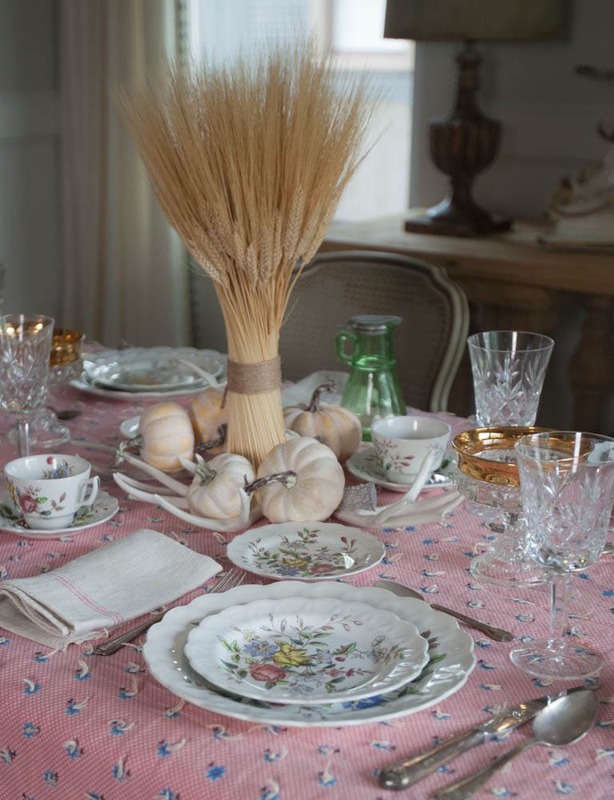 The quilt adds a lovely texture to the table setting. It’s unconventional and fun Carol. Thanks! So beautiful, Anita and I love those dishes! They remind me of a set my grandmother had — such good memories! Great tips and you always put together a great table whether you have just 10 minutes or an entire afternoon! Love it! You are kind Julie. It was a push, and I didn’t want to cancel, so there you have it. 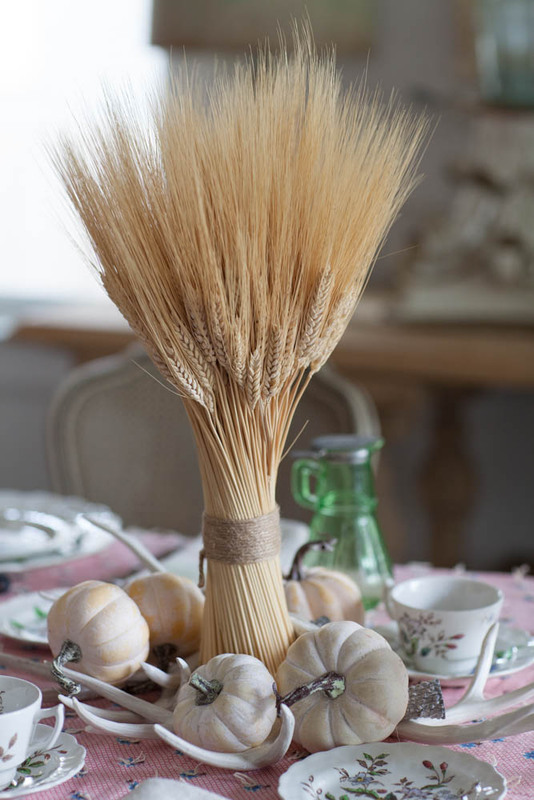 Love using wheat…it just says autumn so simply and that is all you need! Your table was over the top amazing Janet. Love using quilts like that and the wheat as well. 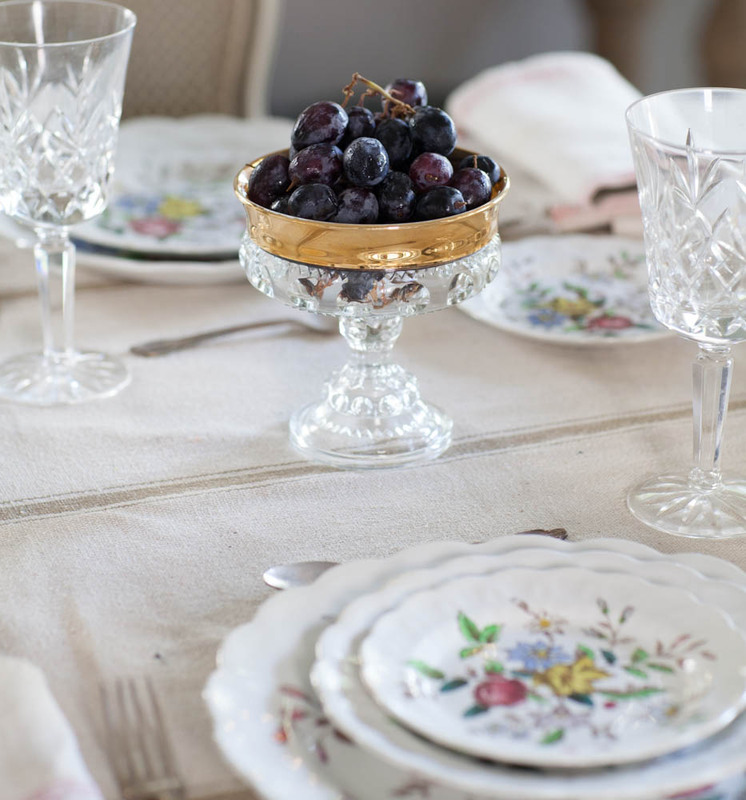 Your china is really pretty and the flatware to die for! Very nice, thank you. Thanks Karen. I love the new dishes. This time of year is a good time to keep faux bittersweet on hand along with about 3 pumpkins, faux or real…the bittersweet is so pretty running in and around the pumpkins for a beautiful, low centerpiece for Thanksgiving. Wish I had some BJ. That’s a great idea. Yes do not forget to get out of the work clothes and jump in to something that reflects your art . Putting together yourself is fun and sometimes I have to remind myself this also is part of the pkg when having people over ? Copy away Lori, and I suspect you are much more talented that you give yourself credit for. The table turned out very cute!! Thanks for the different tip. The silverware from the hotel is so pretty. Love remnants but always stress over how to finish the edge. Ideas? Oh if I’m in a hurry, I press the ends, then tape them in place or use pinking shears. Anita, just love your quilt and remnant that you used for a tablecloth! Being a “country” gal, I love the quilt the best! 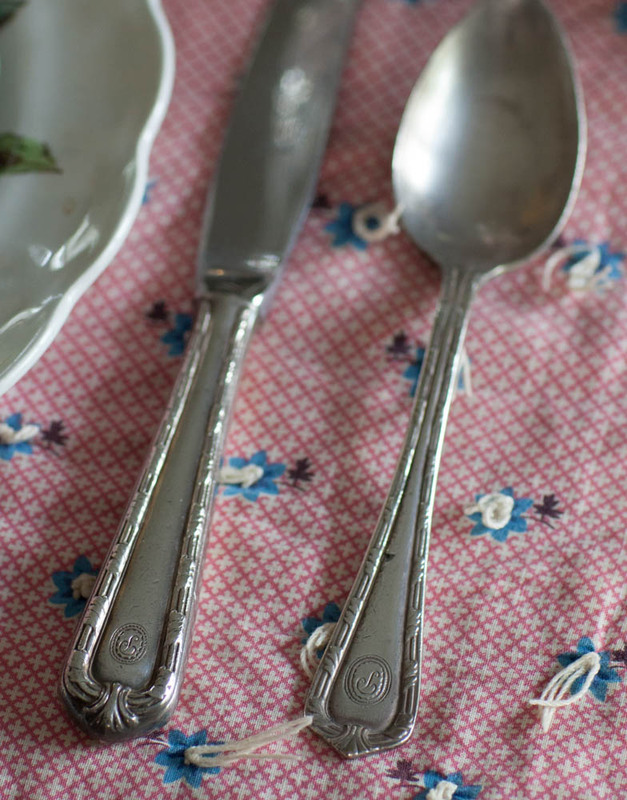 Your new dishes are gorgeous as is your antique silverware. Your table is beautiful! You always do such a lovely job with all your decorating! Have a blessed day! I think it’s just as fun to put together an impromptu table, and you’ve set a beautiful example. I like to set a simple table using whatever dishes seem to fit the occasion, pretty placemats, and always linen napkins with a napkin ring. Either fresh flowers from the garden or something in the house usually is available that can be used for a centerpiece. Often I have fresh flowers on the dining room table as a matter of course. This is a fun series. I appreciate you talented ladies. 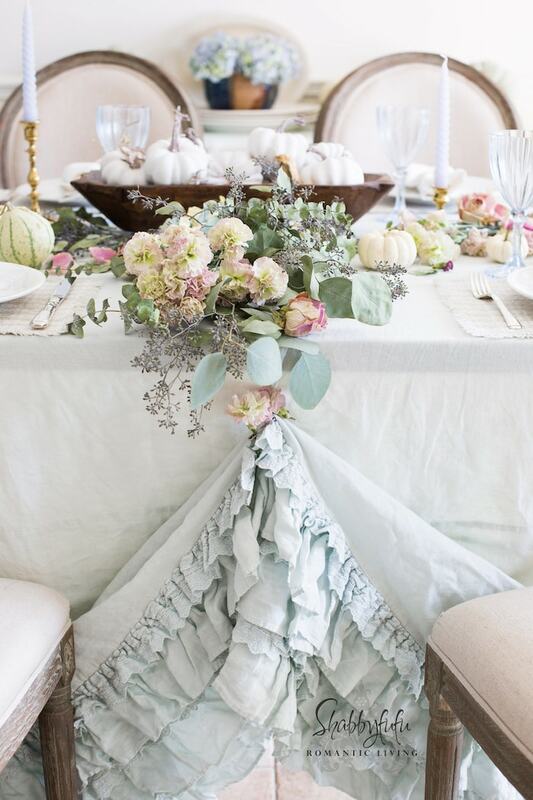 I love the way you pulled such a gorgeous table together with everything you had on hand! Looks fabulous!! I have used a quilt, yours seems to match so well! I have two sets of China (mine and my husband’s mothers)’ and it is nice to rotate them. Love your ideas and today is so creative and pretty. I think the wheat is so pretty, and your dishes are beautiful. 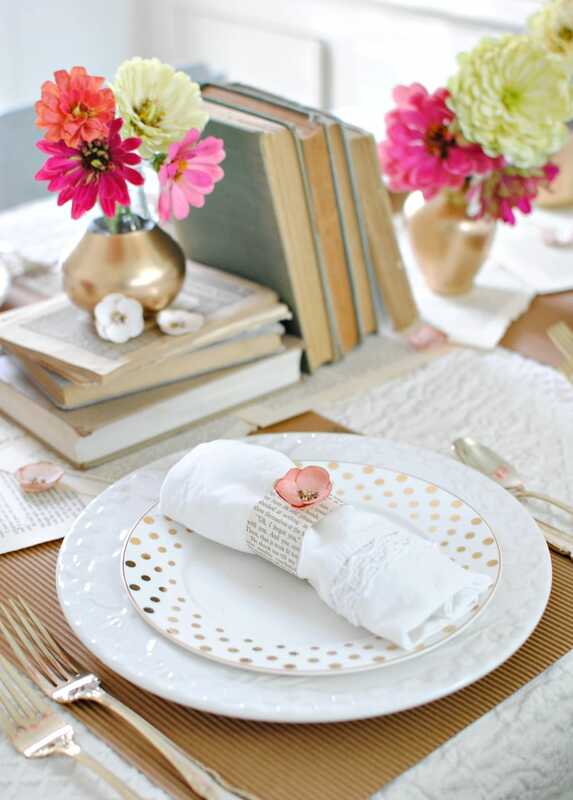 Fabic remnants are such a great idea for a table covering and relatively inexpensive. 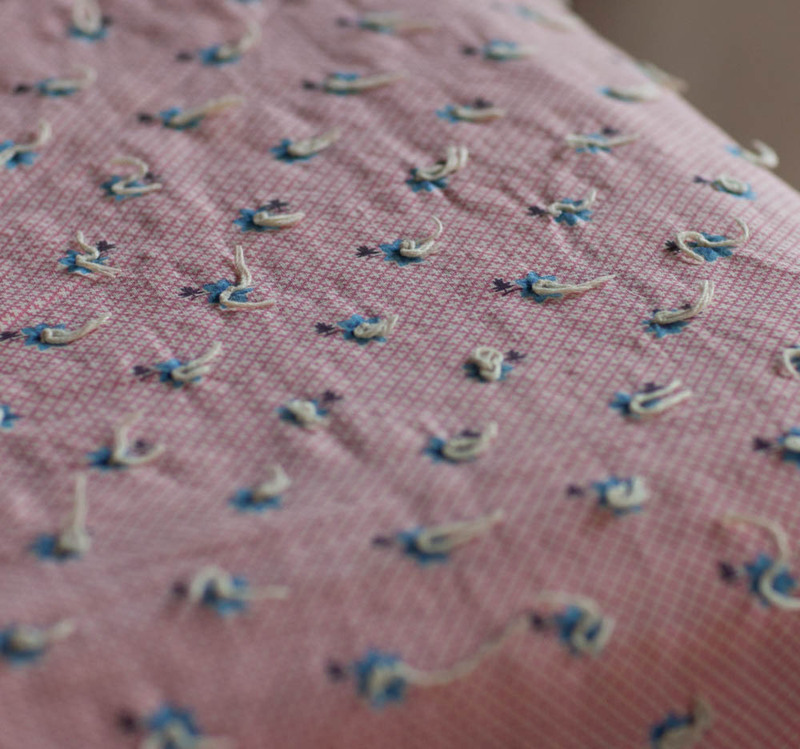 If you don’t sew, you can use the fast and easy iron-on hem binding. For a fall centerpiece I sometimes like to use fresh produce as an alternative to flowers. 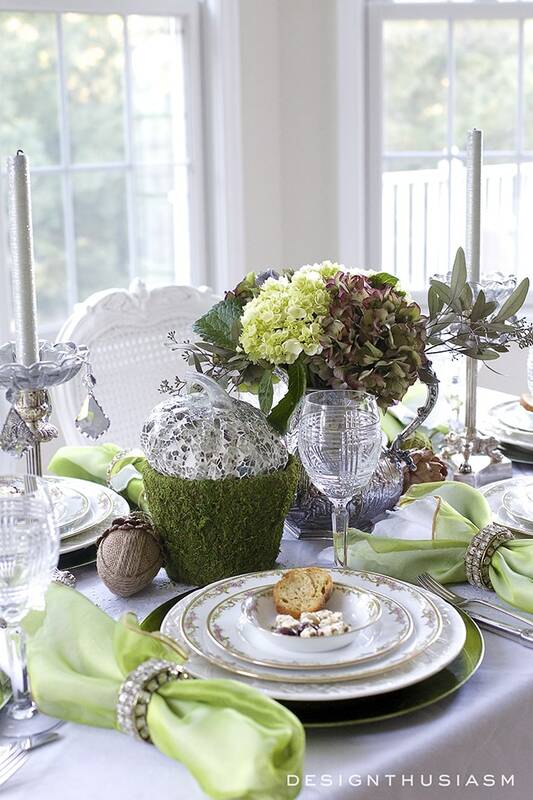 A basket of green or red apples or pears looks pretty as a fall centerpiece. Sometimes I tie a simple name tag to the stems and place one at each plate setting. Another favorite is to pile up a bunch of whatever colorful veggies I have on hand such as red and green cabbage, beets, carrots, turnips, sweet potatoe, peppers, etc. Add a few fall leaves, pretty ribbon or raffia and you have a beautiful centerpiece representing nature’s bounty. 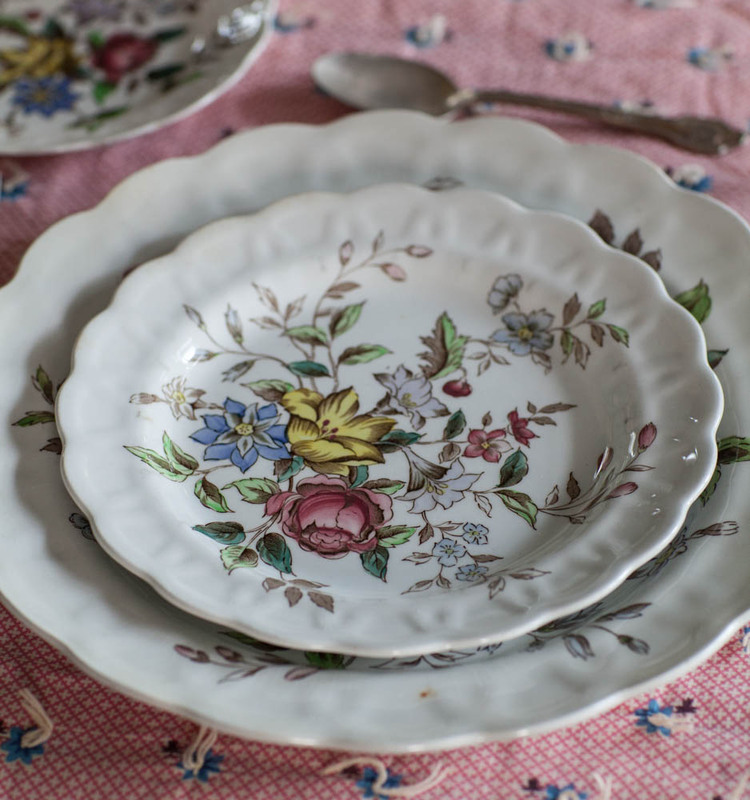 Love those pretty dishes, Anita! Wouldn’t it be fun to be a plate designer? 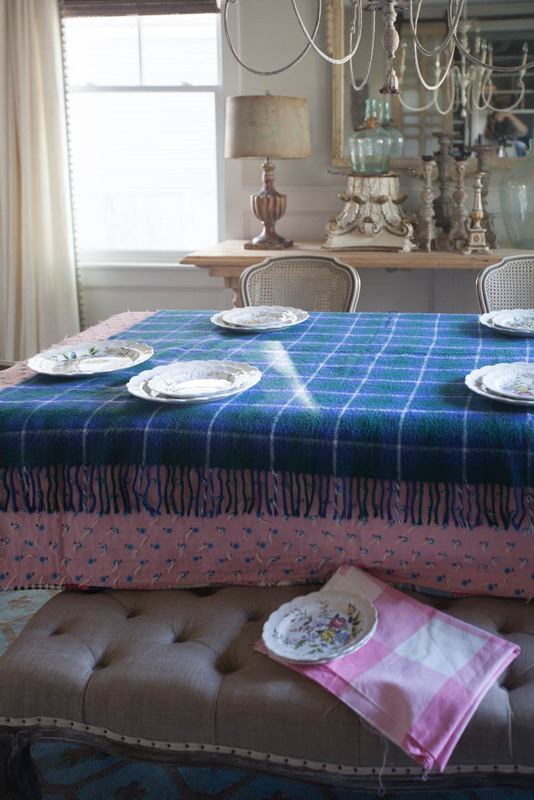 How clever to use a quilt for your tablecloth! Love the more elegant look! You’ve inspired me to go to the attic for my Jewel Tea today…colors are perfect for autumn now. I’ve been oil painting pumpkins, boots and a rooster…he’s not done yet. I’ve also made some white pumpkins from a thrift store bargain shirt. Hope you’re safe and the storm keeps us all helping those who need it. I’m going to clean out my linen closet and donate extra sheets and towels left over when I closed my B&B…prayers.